Magherafelt Sky Blues exited the McReynolds Cup at the semi-final stage to arguably the best team in the league. With only twelve players available due to injury, suspensions and unavailability the management team of Quinn and Hurl had to take their place on the Blues bench. The first half was an entertaining end-to-end game, both teams creating and spurning good chances. Monaghan fired narrowly over the bar before Newtowne hit the post. Monaghan then fizzed one past the post just before Murray scored with an expertly taken free kick. Newtowne spurned a couple of chances before Stewart clipped the bar with a fierce shot. As half time approached Newtowne equalised when the Blues failed to clear. 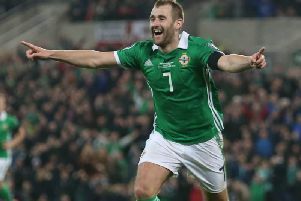 The second half began much the same as the first, both teams playing attacking football and the Blues spurned chances to take the lead when O’Neill fired wide twice. Newtowne then took the lead on 55 minutes but the Blues then had two great opportunities to equalise through Monaghan, who curled his effort wide and Stewart whose effort was cleared off the line. Newtowne scored their third and as the Blues tired with O’Kane and Monaghan having to come off Newtowne scored three in last 15 minutes. A very creditable performance for 75 minutes from the depleted Blues team with Murray winning the Blues man of the match award just ahead of O’Kane. Team: Maguire, Spinu, O’Kane, Rafferty, Campbell, Badger, Stewart, Monaghan, O’Neill, Murray, Brady. Subs: McCormack, Hurl, Quinn.